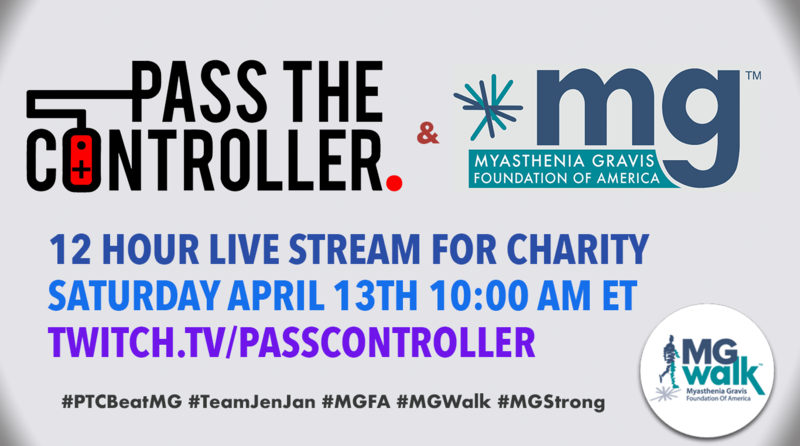 In 2019, a member of the Pass The Controller family– Brenden’s partner Jen– was diagnosed with the rare, neurological disease Myasthenia Gravis. To read Jen’s full story and journey so far you can check out her team page here. In order to help doctor’s find a cure, we will be putting on a twelve hour Twitch live stream to help raise more money for research. Any contributions or social media sharing is much appreciated so Jen and other people affected by this disease can have hope for a cure. To donate to Brenden’s team page please use this link. The live stream will be on April 13th, from 10:00 AM EST onward on the official Pass The Controller Twitch channel.